Car Detailing Vaughan offers complete interior and exterior detailing for semi-trucks and sleepers. Detailing for these large vehicles is an important part of their maintenance but their large size can often make them difficult to properly service without expert help. With our professional interior and exterior detailing, we’re able to bring this service to you around your schedule. We supply our own electricity and water for the ultimate in convenience for any size sleepers detailing job. To learn more, call 647-920-5199. Sleepers and semi-trucks are perhaps some of the hardest used vehicles on the road. Acting as both transportation and part time living quarters, these large trucks face a lot of wear and tear along with the effects of spills, dirt and more. Because operators of these vehicles often spend so much time in them, it’s important to make sure they are clean, safe and reliable. Regular semi-truck detailing is a vital way to not only improve the appearance of your truck but also increase its safety and longevity. These trucks, which are as expensive as they are massive, rely on regular and thorough maintenance to minimize repair costs and to catch hazards before they become problems on the road. Engine and Wheel Detailing: Both engine and wheel detailing are about more than appearance. When you get your engine detailed, we not only clean your engine and make it run more smoothly, we also reduce the chances of overheating and find problem areas before they become major issues. Similarly, wheel detailing increases the smoothness of your ride and finds issues like loose or damaged parts. By cleaning away dirt and debris we can improve traction and check for weak areas in your tires. Customizable Packages: With Expert semi-truck detailing from Car Detailing Shop, you can choose from a range of interior and exterior detailing packages that can do everything from simple interior cleaning and reconditioning to a complete workup that will transform your truck into a like new state. Premium Services: Car Detailing Shop offers both Pet Hair Removal and Ozone Generator as add on sleepers detailing services. If you bring a four-legged friend along with you in your truck, Pet Hair Removal is an ideal service to reduce allergens and keep your truck looking and smelling nice. Our Ozone Generator is also available to eliminate odors and bacteria leaving behind a clean, fresh smell and appearance. 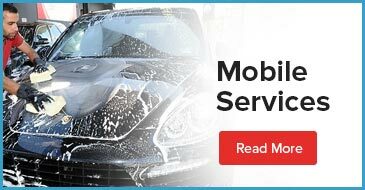 Car Detailing Shop offers a range of packages and prices for sleepers detailing to meet the needs of individuals and fleets of trucks. For personalized pricing estimates, call Car Detailing Shop today at 647-920-5199!